Figure 1: Sometimes the authentic hardware takes up too much damn space! Some can also be handy in converting software from disk/cassette images to a form where the programs can be loaded into your modern machines. Whatever you want to use them for, they can be a lot of fun and most are free. These are for Windows XP and above. They may or may not work on earlier platforms. They are not the only ones out there. They are just the ones I use. Some are still supported and some are not. Some come with ROMS and some do not. ROMS are not difficult to find on the Internet though. By the time you read this it will already be out of date. Make sure you get the latest version from the websites listed. 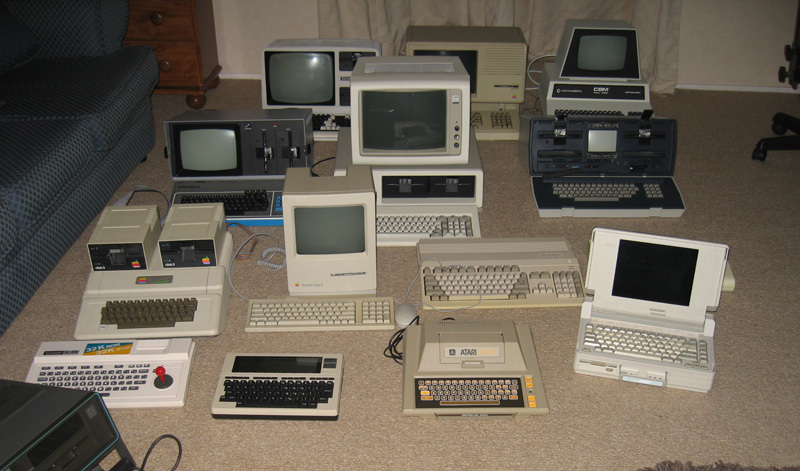 Apple II series AppleWin 1.26.1.1 Apple II+ and IIe also. Very good. Also supports the virtual Z80 card. Apple IIGS KEGS32 0.91 Very good. Get the ROMS and software from this site. Apple Lisa LisaEM 1.2.6 Sets the emulator within a Lisa image. Good. Lisa Office install disks required. Apple Mac (1980s and 90s) Softmac XP 8.2 Good but 32-bit only. May need to run in a virtual XP environment if 64-bit. Can be tricky to set up. Atari 8-bits Atrari800 Win Plus 4.1 All the Atari 8-bit range including the 400, 800XL and 130XE. Very good. Atari 16-bits Steem SSE All the Atari 16-bit range including the 520 and 1040ST. Amiga 16-bits WinUAE 3.5.0 For the Amiga machines. Good - Somewhat confusing to configure. CP/M 8-bits myZ80 1.24 For machines like the Osborne 1 and Kaypro II. May not work in Vista or above. EACA Colour Genie Genieous 1.0.4 Very good. I helped test this one. Exidy Sorcerer JSorcerer 1.3 Java-based emulator which can be downloaded or played on the web. (not compatible Windows 10) From an IBM-PC to modern day. Mostly good but not for MS-DOS games. Sinclair QL QemuLator 3.1 Shareware. Great program. Easy to set up and run. Tandy Colour Computer Xroar 0.34.8 Actually a Dragon emulator but with a CoCo ROM it becomes a CoCo! TRS-80 Model 1 and Model 4 TRS32 1.28 An good emulator for the Model 1/III/4 and 4-P. Disk image tools avaialble too.